As mentioned before, Maharaj does have the bearing of an all knowing wizard. Not just on spiritual matters but even on material things. On the morning drive to the Manor, Maharaj was pleasantly chanting to himself. I had accidently put the heating on full blast, soon enough a feeling of déjà vu came as Maharaj looked at me quizzically and questioned why the Brits are so much into their heat? They have the Gulfstream coming through and so it’s never as cold as Europe and yet they have the hottest houses! The cold in Holland is a different matter, particularly the Friesland area. Maharaj went into the fascinating history of the North Europeans. For example, the Friesland people are actually of Celtic origin while the rest of Holland is completely Germanic. The Germanic people can be overbearing, but the Dutch contingent is probably the worst and by far the most stubborn. That is why they have always maintained their separateness from Germany. 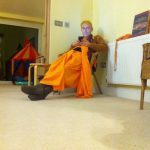 Soon Maharaj arrived at the Manor, near the end of Guru Puja and commenced his class. It could have been a continuation of the conversation in the car for it was all about the demonic tendencies in humans. Kamsa used the scriptures but twisted their meanings. He was also confused; one moment he wanted to kill Devaki and the next minute he was feeling some overwhelming family affection. There was some semblance of human affection. But this affection is hollowed out by his own desires and was very external. One moment he was one thing then the next minute he switched. Now Devaki wanted to believe him because she is soft-hearted but he was influenced by modes of nature so his family affection was never going to be that deep. Of course, Vedic culture certainly helps to curb the demonic tendencies. Just like in astrology when one is dominated by one planet and then another, you become a completely different person. So the scriptures will give that awareness. But it goes deeper, like when Indra tried to kill the Vrajavasis and Krishna asked why he was doing that. Indra replied that he was proud. The devotees are able to curb their pride through intelligence but he was angry. But Indra himself IS also a devotee? So the point is, it’s not JUST demons who are prone to this behaviour, we also have to be introspective. Maharaj made a very deep point that we’re all operating under different combinations of the modes. 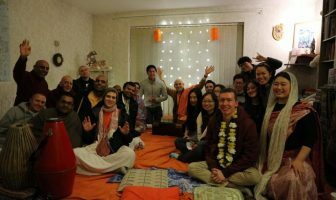 So externally we may act the part of the ideal devotee, folding our hands nicely and saying all the sweet, humble stuff. Maharaj then did a side splittingly funny impression of a devotee that bought the whole house down. BUT inside there is still a raging animal within us like when we ravenously gobble up a mangal aarti sweet when no one’s looking!! Cue more laughter. The whole situation reminded Maharaj of a book he once saw in a German bookstore called ‘The Inner Schweinhund’ or ‘The Inner Pigdog’. Pigdog apparently is a common German term! We all have to be aware of the Schweinhund within us. We’re in a war and infiltration is the worst tactic of the enemy, the enemy within. It was such a deep class, I’m only giving the basics but Maharaj gave a comprehensive analysis of the human condition regardless of whether one calls oneself a devotee or not. Yet at the same time, Maharaj conveyed it in a way where you get the impact but you’re also left in stitches because of all the humour he uses to get the point across! 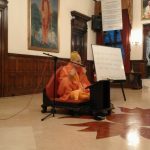 Maharaj concluded by giving a wonderful glorification of the legendary Agnidev Prabhu who was present in the class. 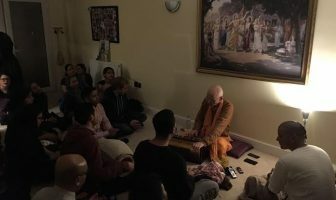 And how in Radhadesh recently, Agnidev Prabhu didn’t just do his spell binding kirtans but spoke at length on the history of bhajans in Iskcon and how he became part of it all. And that was something Maharaj was highly appreciative of. Agnidev Prabhu ki Jai! Afterwards both personalities expressed mutual appreciation for each other, exchanged some personal words, realisations and warm embraces. It’s always amazing to see the dealings between great vaishnavas. Something for us to emulate. 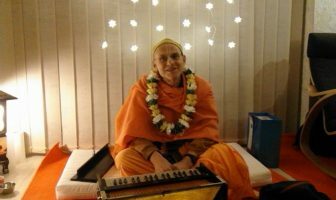 …Later as Maharaj was freshening up in the ashram, he further glorified Agnidev Prabhu and his brilliant translation of Krishna tave Purina by Srila Prabhupada. He got the essence of it perfectly. Before, another devotee named Jaya Sacinandan Prabhu had translated it but Agnidev Prabhu’s one was better because he brought it directly to Krishna as it was meant to be. The conversation then moved onto the different servants Maharaj has had. Nimai Prabhu would be relieved to know that Maharaj considered Nimai to be a very switched on, sharp lad. Maharaj also recalled his time being served by Gurudas Prabhu (larger than life personality who does everything to the max) and started smiling. The rest of us were also smiling. Gurudas Prabhu is one of the characters where there is never a dull moment, everything becomes an adventure. Maharaj mentioned that Gurudas does have a bit of the ‘Guru’ in him. 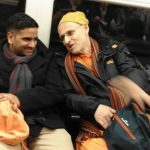 On the plane, he wouldn’t just talk to random passengers about who he is, he would get them to chant Hare Krishna and all! After lunch, arati Maharaj gave a Bhagavad-gita class. It was a mixed crowd of mainly professionals. The main theme was the transient nature of this reality and the old Mr Bean example was given where he pulls up at a hotel and drills holes in the wall, puts up pictures on the wall and drills a door in the wall to make a toilet!! Ridiculous but just as ridiculous is us calling this place home. Our nature is to look for a permanent situation; but one has to remember this is only a transit lounge. In this little temple Maharaj explained how we approach Krishna in his intimate Vrindavan form, not in his universal form. That would be akin to us connecting with an ant! How much of an intimate relationship can you develop with an ant? Afterwards, Maharaj went upstairs to honour prasadam and rest in the VIP room. 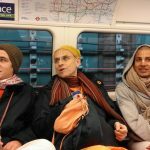 A host of devotees accompanied Maharaj and naturally some devotees starting asking questions. 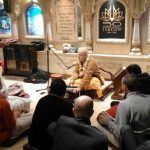 Madan Mohan Govinda Prabhu (the UK head of Bhakti Vriksha) was there and asked some pertinent questions related to devotee care, developing the grhastha congregation and varnashrama. A few questions here and there was okay but Maharaj was insistent that he didn’t want to get into a full blown ‘Q & A’ session, which is what it was turning into. He just needed to recuperate this trip. So after a point, Maharaj deflected the questions to Ter Kadamba Prabhu and went downstairs to rest in the restaurant. The restaurant has a kind of French roadside café feel to it, there was a nice gentle breeze outside, the sun was out and the street was as vibrant as ever. 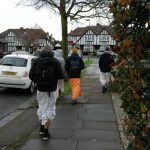 And to top it all, one of the devotees was doing a really sweet but funky kirtan on the roadside with nothing but his voice and a large silver bass drum. It was brilliant, had raw, pioneering mood to it. Sitting at a window side seat, Maharaj was enjoying the ambience. He remarked that was good there, relaxed and chilled; not so formal and certainly no need to put on the ‘sadhu profile’. A couple of disciples were with him. They were tucking into some delicious chilli paneer, creamy cakes and gateaux. And Maharaj was simply giving his realisations about life and Krishna consciousness. A lot of disciples would probably admit that these informal chats are the most nectarian times one can have with Maharaj. He soon got talking about how so many devotees come to devotional life through some sort of bereavement. His own parents left the planet 45 years ago and very close to each other. So near that the funerals were exactly the same, with the same people, sitting in the same position, in the same formation greeting each other, in the same way with the same expressions and the same clothes and the same priest saying the same things and then everyone leaving in the same way!! After the second funeral, Maharaj’s thoughts were, “I’ve been in this movie before.” The disciples couldn’t take it anymore, any more laughter and they would be rolling on the floor!! Meanwhile a Mataji had started distributing books outside and Maharaj observed her, commenting on how expertly she was doing books, using all the tricks to get people’s attention. 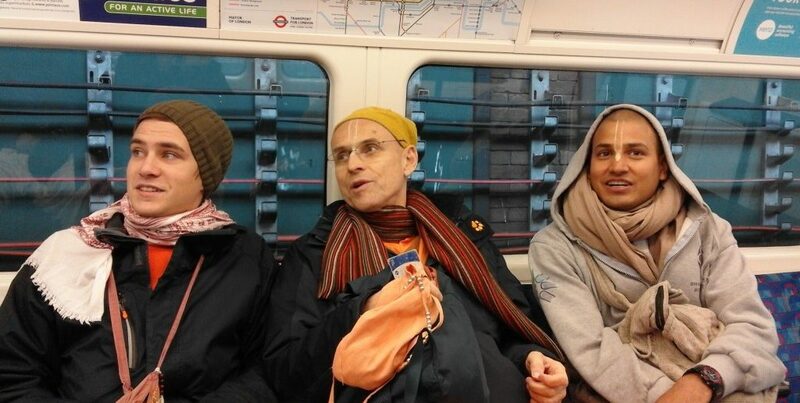 On the train journey back, Maharaj spoke about Jayadvaita Maharaj, his various qualities and areas of interest. In particular, the detailed research Jayadvaita Maharaj has done in the field of hypnotherapy. Maharaj also mentioned a technique that Jayapataka Maharaj uses to remember his thousands of disciples names. He would question them in a testing manner, “Do you know what your name means?” In the process of explaining, the disciple would reveal their names and Maharaj would act as if he remembered all along!! The conversation soon turned to the nitty, gritty aspects of varnashrama. 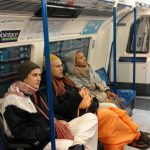 Not surprising since this is one of the hot topics in Iskcon now. While Maharaj explained the ins-and-outs of the Vedic social order, he was quick to assert that in the Golden Age, ultimately there is only ‘eka varna’. Under the mercy of Caitanya Mahaprabhu, the one varna of the paramahamsa will take root. This is not the first time that Maharaj has qualified the concept of varnashrama as being secondary to Mahaprabhu’s shelter. 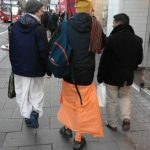 It seems Maharaj has noticed that devotees can get overly hung up on the varnashrama issue, losing sight of the ultimate goal. Oddly enough, it was one of the most nectarian experiences I’ve had with Maharaj which I’ll always remember. 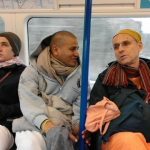 HH Kadamba Kanana Swami Ki Jai!